Throughout the world, Parkinson’s disease is on the increase due, in particular, to an aging population. Indeed, age is one of the main risk factors for this disease, which primarily affects control of motor functions. This is the number of people worldwide living with Parkinson’s disease. Only of diagnoses are made before the age of 50. It is the estimated number of patient suffering of Parkinson’s disease in 2040 in the world. Parkinson’s disease results in the gradual degeneration – or disappearance – of neurons, notably in a specific area of the brain responsible for the production of dopamine, a neurotransmitter involved in controlling movement. A protein called alpha-synuclein has been found to be the essential component of Lewy bodies, inclusions which are present in the affected neurons. 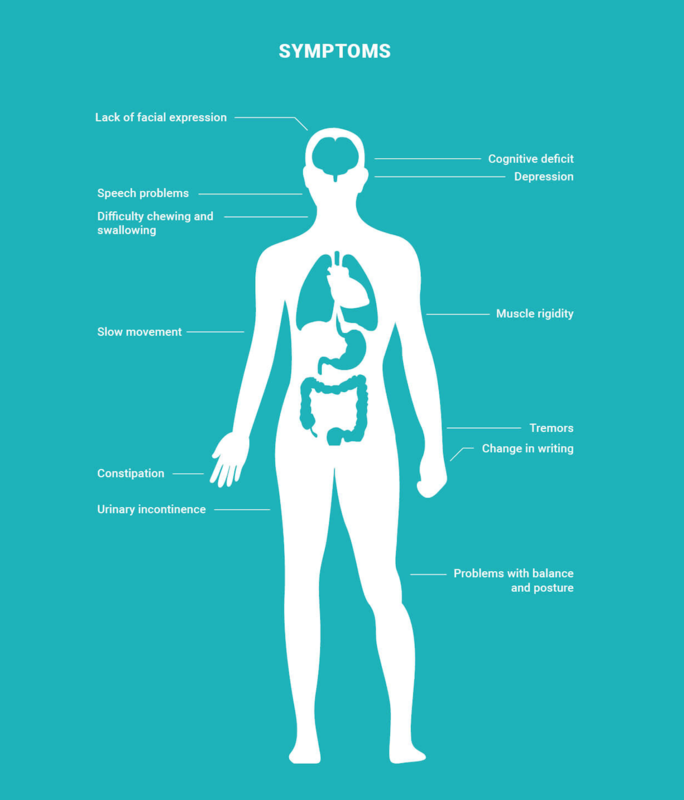 The disease is complex and involves other neurotransmitter systems, which could help to explain the occurrence of other non-motor symptoms throughout the disease course. This deficiency is responsible for the typical signs of the disease, such as slowness of movement, balance problems, muscle rigidity, and resting tremors. Other common symptoms of the disease include mood disorders, sleep disorders, cognitive deficit, problems with constipation, speech, swallowing and the sense of smell, and urinary incontinence. Progression of the disease and its symptoms varies considerably from one person to another. At an advanced stage, the disease results in disability and a loss of autonomy. Medical appointments ensure close monitoring of its health. There is no clearly defined cause of the disease, but there are several factors that seem to contribute. Age, first and foremost; on average the disease starts between age 55 and 65. Several susceptibility genes have been identified, particularly, in cases of early onset of the disease, occurring before the age of 50. Certain environmental factors may also be responsible for the disease, in particular, exposure to certain toxins in the environment such as organochlorine pesticides (organic compounds containing chlorine) and industrial toxins such as lead, mercury, cadmium, or manganese. Research is advancing our understanding of the causes and mechanisms responsible for neuronal degeneration and the onset of symptoms. Researchers are now focusing, as a matter of priority, on identifying mechanisms that slow neuronal degeneration and can be used to help develop curative treatments. Research is currently exploring the involvement of alpha-synuclein in the disease pathway. This protein, which plays a role in signal transmission, is abnormally abundant in the nerve cells of patients. The reason for this accumulation is unknown. WHAT THERAPEUTIC SOLUTIONS ARE AVAILABLE? There are several treatments to overcome dopamine deficiency. They do not slow disease progression, but control motor symptoms. Main treatment is a precursor of dopamine, called L-Dopa, which helps restore motor function for a number of years. The improvement in symptoms is often remarkable at the start of treatment, but subsequently diminishes. Additionally, it causes significant side effects, such as involuntary movements. Other types of drugs increase the activity of dopamine neurons, either by binding to dopamine receptors or by inhibiting the degradation of existing dopamine. These pharmacological treatments carry the risk of side effects, such as confusion, drowsiness, obsessive behaviors (gambling, shopping addictions, etc. ), and digestive disorders. Surgery can be recommended when the disease is advanced and the patient no longer responds to pharmacological treatment. In this case, electrodes are implanted into specific areas of the brain to electrically stimulate neurons. The procedure is known as deep brain stimulation. It may have beneficial effects, but does not prevent continued progression of the disease. More generally, physical activity, stretching and balance exercises can preserve mobility and maintain postural balance. In 2019, Servier joined forces with Oncodesign, a French biopharmaceutical company, to explore a new avenue of research concerning the therapeutic effect of LRRK2 kinase inhibitors (corresponding to a gene in which mutations are implicated in the development of Parkinson’s disease) on Parkinson’s disease, which is intended to slow down disease progression.